I mentioned that it has been “Garden Week” at our house for the past week since the weather is actually warm and gorgeous for a change (unlike what we saw for most of winter). We are just doing the prep work now like cleaning out the flower beds of all the debris, clearing out grass and making beds larger, and cutting back trees and shrubs. My mother and I are planning to plant lots of vegetables this year. The only hard part is getting all of the garden areas prepped for planting and waiting on the last frost to hit so we can finally put our plants in the ground. 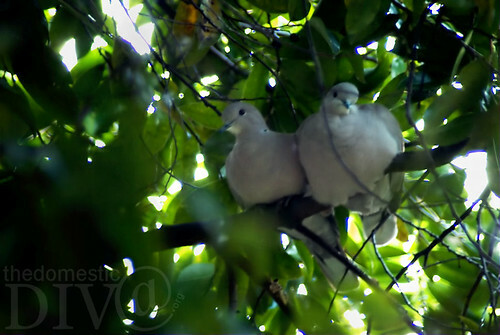 The other day while the kidlets and I were out fiddling around in the garden there were two doves that decided to hang out with us as well. As you can see one of them definitely didn’t have any troubles finding any food for the winter. Do you think that branch will hold him? Are you planning to garden this year? If so, what are you planting? Previous Post Let me breathe! Next Post Kitchen Binder: Part 2: Grab those Coupons! My recent post Sophistishe Partners With StuffBuff!